Me on RUN operating position. The radio was IC-7800. Pavel, OK1MU on S&P operating position with IC-7600. RUN operating position with my HexKey paddle. S&P operating position with IC-7600 and ZACH magnetic paddle. 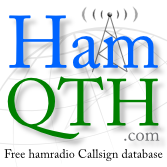 Open M/M combine from RemoteQTH.com. View from one of the towers in the QTH. 6 el. YAGI stack for 15M. It was a great pleasure to be part of the team. See you next year guys!